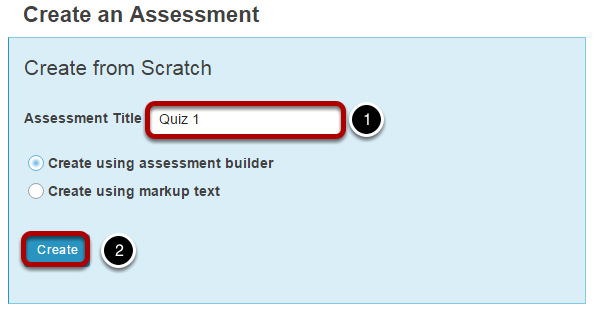 Instructor User Guide Tests and QuizzesHow do I use assessment parts? Assessments are subdivided into parts, but may consist of only one part that comprises all the questions. Parts allow you to create sections of an assessment, each with its own title, questions, question pool draws, attachments (for resources or directions), and question ordering. When you create a new assessment, a part (i.e., section) called "Default" is created automatically. If you leave it named "Default", that title will not appear on your assessment; to change the part's name, click Edit. You can begin adding questions immediately to "Default", or you can add your own parts. New parts will be listed in the order you create them. You can re-order parts within an assessment, and edit each part individually. Your assessment must contain at least one part, but you can remove any of the additional parts you create. You can also remove the "Default" part, as long as you've already created another part to replace it. For more information on adding parts, see How do I add multiple parts to an assessment? Parts may be added to any assessment. Select an existing assessment or create a new one. In Tests & Quizzes, open the assessment and find the part. To edit the name and any of the information and settings associated with a part, next to that part's name, click Edit. Type a title into the text box provided. Note: If the part title is marked as the Default, the title will not appear to assessment takers. Use the text box provided to type Information about the created part. Choose the option to author questions one-on-one or select random draw from question pool. If "questions authored one-by-one" is selected, the following options will display. Zoom: If &quot;questions authored one-by-one&quot; is selected, the following options will display. Select the radio button to order the questions As listed on Assessment Questions page, or to order them Random within Part. If "random draw from question pool" is selected, the following options will display. Zoom: If &quot;random draw from question pool&quot; is selected, the following options will display. Enter the number of questions to draw from the selected question pool. Select the question pool from the drop-down menu. Choose to either randomize student questions each time an assessment is submitted or randomize student questions once for all submissions. Enter the point value for correct answers on each question. Note that all questions in this random draw must be worth the same amount of points. (Optional) For True/False and Multiple Choice, Single Correct questions, you may also enter a negative point value if a question is answered incorrectly. Note: Point values entered here override any value that was specified for individual questions in the corresponding Question Pool. 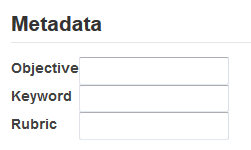 Enter Metadata, such as the objective, keyword, and rubric, into the text boxes provided. New parts will be listed in the order you create them. To switch the order of two parts, before a part's name, change the number in the drop-down list next to "Part". For example, if you have three parts, and you want the third part to appear first, use the drop-down list to change the 3 to 1. The third part will become the first part and the first part will become the third. The example illustrated will exchange the places of Parts 1 and 2. Your assessment must contain at least one part, but you can remove any of the parts you create. You can also remove the "Default" part, as long as you've already created another part to replace it. You can remove the Part and its questions altogether or remove the Part as a section and retain its questions. Note: The first part listed on the editing screen will not have the Remove option. To remove the first part, you must switch its order with another part (if you don't have another part, you'll have to create one), and then click Remove. In the open assessment, find the part. Next to the part's name, click Remove. Choose to delete or combine the questions. Remove part and all questions. 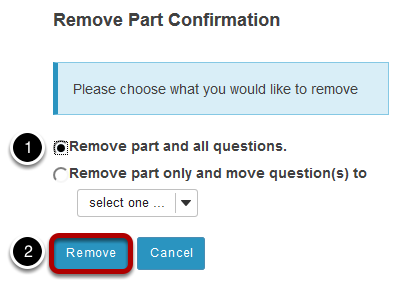 Remove part only and move question(s) to (use the accompanying drop-down list to choose another part). Prev: How do I add multiple parts to an assessment? Next: What is a question pool?